Here is my latest furniture restyle. I found this table and chairs on ebay and knew they needed my TLC. And I was drawn to those lovely claw feet and the curvature of the chairs. 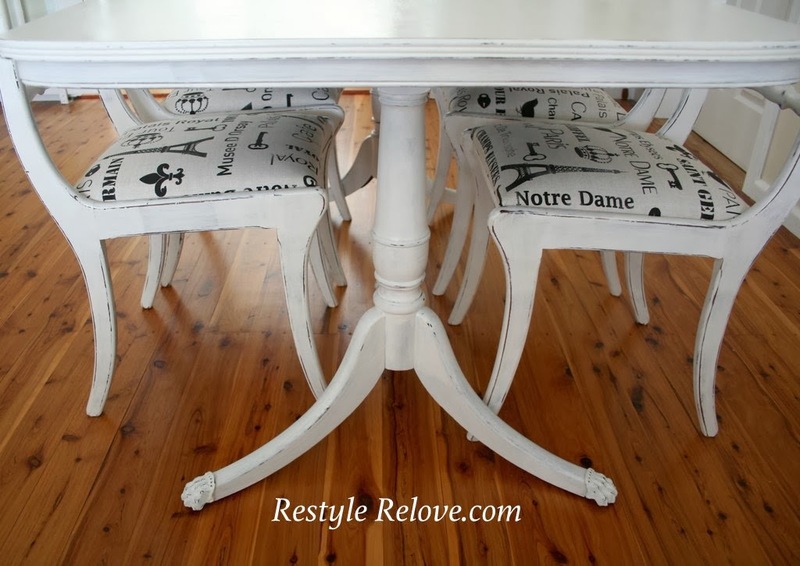 Like most my furniture makeovers, I decided to go with a distressed white. 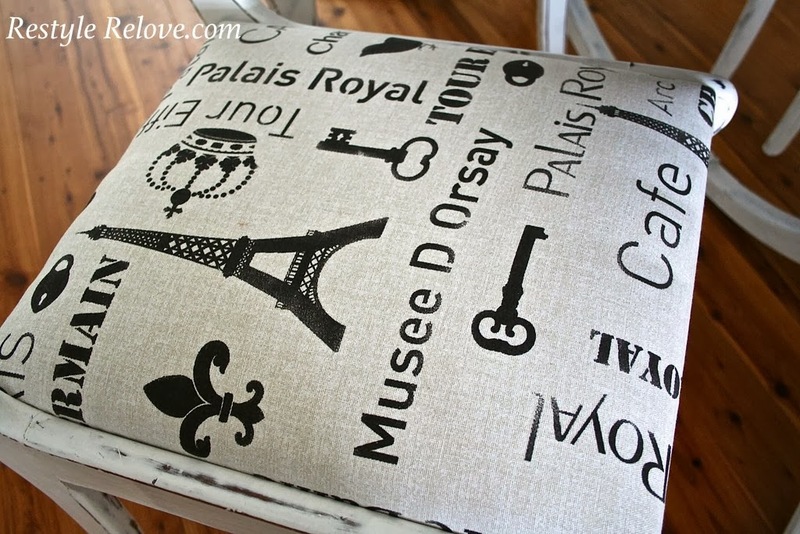 I recovered all the seats with this cute black and white french designed fabric. And put new webbing on the underneath of all the seats. Given their age the chairs needed it. 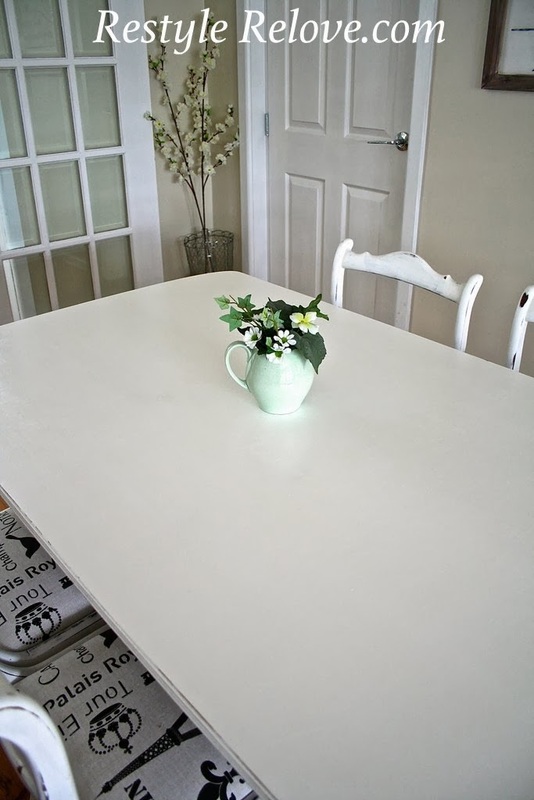 I used three coats of DIY chalk paint on all the chairs and table. Then sealed them all with clear poly. The top I gave 3 coats so it is well protected. I did consider keeping this one for myself, but have decided to give it a new home. Feel free to drop me an email if you are interested. I love the set with it's new farmhouse chic look. You did a great job! Really love the shape of those chairs. Very pretty set and love the fabric on the chairs. That sign hanging in the room is so pretty too!! Thanks Cynthia! I made that sign and I slip different inserts in like at Christmas and Easter. It's very versatile. This set is gorgeous. You did a fabulous redo on it. Love those chairs. Great job. Looks like a Duncan Phyfe? Not even sure if that's the spelling...but your makeover looks lovely! Amazing what a coat of paint and some new fabric can accomplish. Would love for you to share at Fridays Unfolded! Hi Julie, just popping over from your spotlight at Junk Chic Cottage. 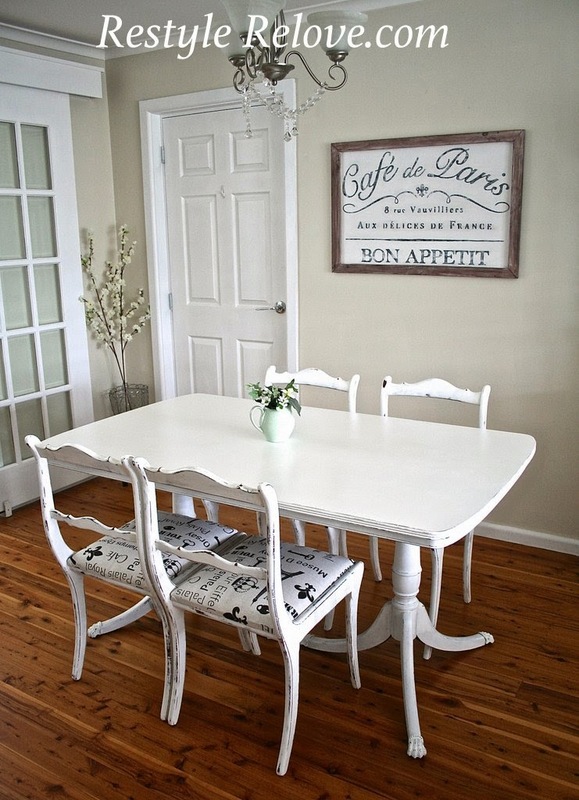 What an amazing transformation on this dining set. So pretty! I am visiting via Junk Chic Cottage. I don't have much time right now, but I will be back to explore more of your blog. I love your style. 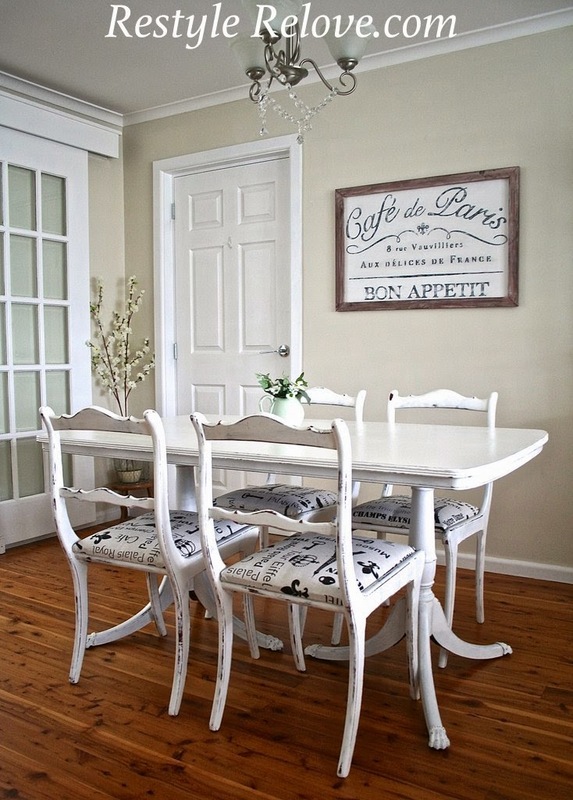 What a beautiful makeover on this table and chairs...luv the fabric that you used. That's a sweet looking table. 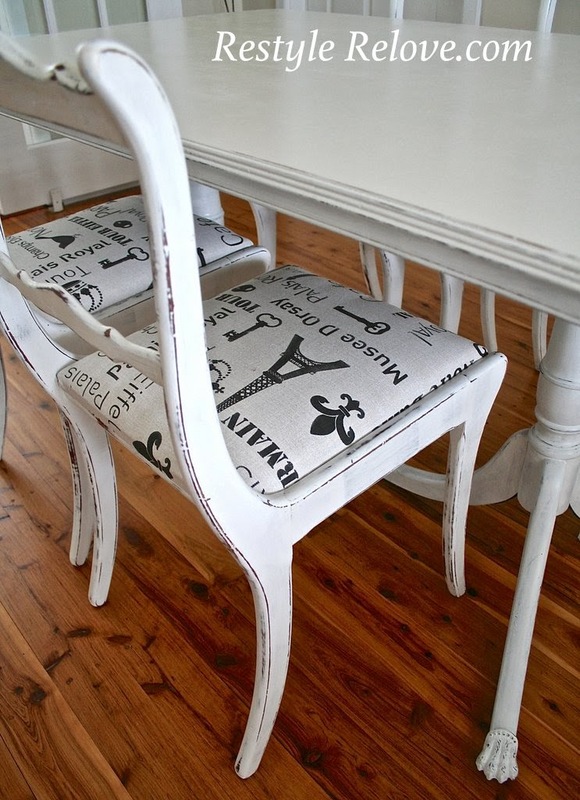 Love the table's feet and chair backs! love the white, just beautiful! I am so in love with your dreamy dining set!!! Happy to be featuring you tomorrow! Lovely job on this pretty Duncan Phyfe dining set! I would love to know where you got the fabric for the seats on the chairs. Also, would you share what brand of clear poly you use?